Killing animals for food, fur, leather, and cosmetics is one of the most environmentally destructive practices taking place on the earth today. The Krishna consciousness movement’s policies of protecting animals, especially cows, and broadly promoting a spiritual vegetarian diet could—if widely adopted—relieve many environmental problems. Humans should not slaughter animals for food. They should be as compassionate to cows and other farm animals as they are to their pet dogs and cats. Nonviolence extended beyond human society is known as ahimsa, an ancient Vedic principle still practiced in some parts of the world. Cows are the most valuable animals to human society. They give us fuel, fertilizer, power (for tilling, transport, grinding, and irrigating), milk and milk products, and leather (after natural death). The killing of animals violates karmic laws, creating collective and individual reactions in human society. Well-documented medical studies show that flesh-eating is harmful to health. Mass animal-killing for food and fashion erodes mercy, reducing respect for all kinds of life, including human life. Meat diets are more expensive than nonmeat diets. If the world switched to a nonmeat diet, it could radically increase its food output and save millions of people from hunger, starvation, and death. Massive animal slaughter is destroying the environment. We shall now document this destruction, keeping in mind that it amounts to violence against the earth. It also has karmic consequences. The meat industry is linked to deforestation, desertification, water pollution, water shortages, air pollution, and soil erosion. Neal D. Barnard, president of the Physicians Committee for Responsible Medicine (USA), therefore says, “If you’re a meat eater, you are contributing to the destruction of the environment, whether you know it or not. About half the world’s grain is consumed by animals that are later slaughtered for meat.8 This is a very inefficient process. It takes 16 pounds of grain and soybeans to produce 1 pound of feedlot beef.9 If people were to subsist on grains and other vegetarian foods alone, this would put far less strain on the earth’s agricultural lands. About 20 vegetarians can be fed from the land it takes to feed 1 meat eater. Eighty per cent of the corn raised in the United States is fed to livestock, as well as 95% of the oats. Altogether, 56% of all agricultural land in the United States is used for beef production.10 If all the soybeans and grain fed yearly to US livestock were set aside for human consumption, it would feed 1.3 billion people. Overgrazing and the intensive production of feed grain for cattle and other meat animals results in high levels of soil erosion. According to Alan B. Durning of the Worldwatch Institute (1986), one pound of beef from cattle raised on feedlots represents the loss of 35 pounds of topsoil.11 Over the past few centuries, the United States has lost about two-thirds of its topsoil. In other countries, such as Australia and the nations of Africa on the southern edge of the Sahara, cattle grazing and feed-crop production on marginal lands contribute substantially to desertification. Burning of oil in the production of feed grain results in air pollution, including carbon dioxide, the main cause of global warming. Another major source of air pollution is the burning of tropical forests to clear land for cattle grazing. The meat industry, in addition to producing carbon dioxide, is also responsible for other greenhouse gases, such as methane. Methane is produced directly by the digestive process of cows. This greenhouse gas is considered very dangerous because each molecule of methane traps 20 times more heat than a molecule of carbon dioxide. How big a threat to the planet is the methane emitted by cows? Overall, the effect is not significant, certainly not enough to justify fears of cows destroying the planet by global warming. Each year about 500 million tons of methane enter the atmosphere, 15 contributing about 18% of the total greenhouse gases. Cows account for 60 million tons of the methane, about 12%.16 Therefore, methane emitted by cows amounts to only 2% of the total greenhouse gas emissions. It should also be kept in mind that feedlot cows, because they eat more, produce more methane than range-fed cows. In India, there are about 270 million cows, but 99.9% of them are range fed.17 Therefore they produce less methane than an equivalent number of feedlot cows. About 50% of the water pollution in the United States is linked to livestock.18 Pesticides and fertilizers used in helping grow feed grains run off into lakes and rivers. They also pollute ground water. In the feedlots and stockyard holding pens, there is also a tremendous amount of pesticide runoff. Organic contaminants from huge concentrations of animal excrement and urine at feedlots and stockyards also pollute water. This waste is anywhere from ten to hundreds of times more concentrated than raw domestic sewage. According to a German documentary film (Fleisch Frisst Menschen [Flesh Devours Man] by Wolfgang Kharuna), nitrates evaporating from open tanks of concentrated livestock waste in the Netherlands have resulted in extremely high levels of forest-killing acid rain. Of course, saving the environment is not the only reason it’s good to avoid eating meat, particularly beef. Further reasons, some of which we mentioned at the beginning of this chapter, are discussed at length in other books published by the Krishna consciousness movement (see the resource section at the end of this book). During the process of converting grain to meat, 90% of the protein, 99% of the carbohydrates, and 100% of the dietary fiber are lost. It is well documented that vegetarians are less likely to contract certain kinds of heart disease and cancer. So better health is one of the benefits of the flesh-free, karma-free diet practiced by the Krishna consciousness movement. This diet is not only healthier but also more satisfying to the mind and taste buds than meat-centered diets. Furthermore, eliminating meat-eating would release a vast quantity of food grain for human consumption, thus helping solve the problem of world hunger. And on an ethical level, stopping animal-killing would help induce a greater respect for all kinds of life, including human. This was not the first time I had been asked to comment on the way we might interact with the natural world from the perspective of human industry. In 1992 the city of Hanover, Germany, asked my firm to prepare design principles for the World’s Fair to be held in the year 2000. Of all design principles, there is one that my colleagues among the indigenous peoples around the world insist is the most important: “Respect the relationships between spirit and matter.” We say all design principles flow from this one; this is the source of our joy, our humanity, and also … our responsibility. I have come to see the act of design itself as one of the first signals of human intention. And if the modern world of industry were being intentionally recreated on a clean slate today, it would represent a most terrifying and unnatural design assignment. Can you imagine being instructed to use human intelligence to design a system that releases billions of pounds of highly toxic material into the air, soil, and water every year? Can you imagine being instructed to create places so befouled by bad air that people fear going outdoors or need a lamp at midday to see their way? Can you imagine, on a planet whose surface is abundant with natural energy flows driven by the sun, being instructed to dig up ancient toxic materials whose very burial has allowed us to inhabit this surface, and further being told to burn it, pave with it, and allow products derived from it to persistently invade almost every living system, to the point where some species can no longer even reproduce? Can you imagine being told to use a wood whose harvest is effectively causing the genocide of a tribe of people half way around the world? One might say these instructions would be not only unethical but unintelligent. One might then conclude that these instructions could not possibly foster ethical or intelligent designs. And yet the horrifying effects mentioned above are some of the daily results of modern industrial artifice. So if we as a civilization are to begin interacting with nature in an ethical and intelligent way, we must ask ourselves if human beings could imagine a better series of “instructions” and design assignments to which we can apply our unusual skills. This is clearly a central question inherent in the issues being raised by Divine Nature: how do we find, and come to peace with, our place in the natural world? From my design perspective, it is obvious that we should be working with, and not against, nature’s own design principles. For example, nature barely entertains the concept of waste: one thing’s waste is another thing’s food. Everything moves in cycles: cradle to cradle, not cradle to grave, as modern industrial protocols would ask us to believe. Nature operates on “current income”—it does not mine or extract energy from the past, it does not use its capital reserves, and it does not borrow from the future. Nature is an extraordinarily complex yet elegant and efficient system for creating and cycling nutrients, so economic that modern manufacturing methods pale in comparison. And nature loves diversity: everything is different from everything else, but everything has its place. Today politicians, scientists, and business people are becoming aware of the critical importance of biodiversity; they are recognizing the richness of all living systems and the infinitely complex interdependencies within and between them. They are beginning to see that everything is indeed connected to everything else, and they are becoming aware of an impending crisis. Some see grave dangers, others opportunities lost. I was told a story recently about an eminent naturalist who went to see the chief of staff of a U.S. President to explain the importance of a proposed international biodiversity convention. Apparently the politician, who was trained as an engineer, responded in effect: “Oh, I see, you’re talking about an Endangered Species Act for the whole world, and it sounds like the Devil is in the details,” to which the scientist responded, “No, sir, God is in the details.” Einstein is credited with noticing that almost no problem can be solved by the same consciousness that created it. The change in consciousness needed now must be deep, informed, and integrated with a great deal of ancient wisdom. As this book explains, we must be humble enough to recognize that those who came before us have pondered many of our concerns. In the world of design, some of the proposed solutions may reflect the same linear consciousness that got us to our present state. A single example may suffice. In many places in the world, designers are looking toward the production of biomass to produce energy—growing grasses, trees, etc., specifically to be burned to create heat and electricity. The problem is that while the system may be what engineers call CO2 neutral—i.e., it releases only as much carbon dioxide as was absorbed by the plants as they grew to maturity—it represents a linear design that focuses on solar energy alone. Because the system does not close the natural nutrient or water cycles of the soils being depleted, it can reduce biodiversity. The biomass is seen as carbohydrates replacing hydrocarbons, and water is seen in chemical terms, as H2O, and not as part of a larger living organism. Outside nutrients such as mineral fertilizers must be imported to maintain energy production levels because many of the soil-nurturing materials have gone up in smoke. Such a system of energy production is the large-scale equivalent of burning wood to boil water, which really makes sense only where you have a lot of wood and a few people, like a forest tribe. But right now the planet is experiencing a dramatic loss in the number of trees and a sobering increase in the number of people. So if the current system of getting energy by burning either biomass or fossil fuel is continued, it is only a matter of time before population pressure will strain the system to its breaking point. I helped design villages like those described in this book, villages where people are elegantly and efficiently harvesting solar energy in all its myriad forms: as food, in low-temperature thermal collection, in the form of animal husbandry, and as cooking gas from “digested” dung and biomass. Nutrients are returned to the soil, completing an endless cycle of use and refreshment. The intent is clear: nothing is lost and nothing is wasted and nothing needs to be imported from far away. This is the model to which we must turn our attention if we are to create both ethical and intelligent designs. As designers, we are using these models to inform every scale of our work: for products, for buildings, and, yes, even for cities. We are designing products that can be safely composted at the end of their useful life, others that go back to solar powered manufactories to be completely reused over and over, without any waste or release of materials in the cycle, and we are also developing the concept of “zero-emission” industries within “industrial ecologies.” Essentially we are trying to imagine the next industrial revolution: with small-scale, linked, local enterprises, where prosperity is measured by the health of the economic and ecological system in terms of the quality of all life, and where productivity is measured not by how many resources are “used up” by how few people but by how few resources are “used up” by how many people. This is one of the organizing concepts being talked about today under the heading “sustainable development,” and it is indeed wonderful to see people worldwide recognizing that their common security lies in embracing this principle. But even sustainable development has the ring of anthropocentric tyranny, remote form the rest of nature. It often speaks of resource flows but barely touches the most ineffable of relationships, which are also the most human—the relationships between spirit, matter, and place. These intertwined relationships still seem to be the least understood and most resisted by an industrialized world whose guiding principle has been dominion over nature and whose stewardship of the natural world is often patronizing. We must learn again of our kinship with the natural world and enjoy its message, which tells of the value of all life and the rightful human place as part of it. This book, Divine Nature, reminds us that we must learn again to live within the laws of nature and find the means of expressing our human intention as interdependent actors, aware that we are at the mercy of sacred forces larger than ourselves, and aware also that we must obey the laws governing these forces in order to honor the sacred in each other, and in all things. It instructs us correctly: we must come to peace with and accept our place in the natural world in order to enjoy the spirit of belonging to the earth firsthand. According to Divine Nature, the real cause of the global environmental crisis is an underlying lack of spiritual understanding. The authors systematically demonstrate that most proposed solutions are only palliative and that humankind must undergo a profound change in consciousness to live in an environmentally sound way. The Humane Society of the United States Washington, D.C.
“In view of the crying need for excellent literature concerning the interface of spirituality and the environment, Divine Nature is a godsend. 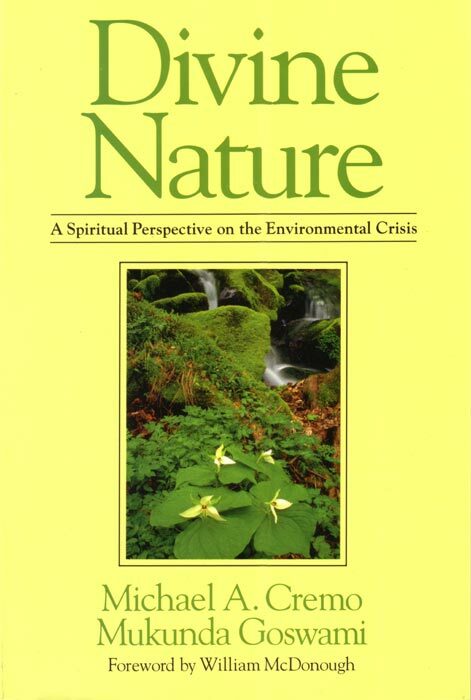 In addition, Divine Nature deserves the attention of scholars and students of religion because it is an insightful, well-researched, and in many ways very practical approach to environmental issues. Does a highly spiritual tradition like Krishna Consciousness concern itself with concrete problems of this world? Do the teachings have a significant environmental impact?